With much to eat and do, Chow, Baby had its day scheduled to the minute. And you know what the gods say to that: Smackdown. First Chow, Baby’s lunch date bailed at the last minute – what’s the point of even having kids, if they’re just going to get sick on you and ruin your friends’ plans? – and worse, he wouldn’t divulge the location of the cool-looking dive he had spotted, so Chow, Baby couldn’t go ahead without him. Fine. Chow, Baby has other friends, and some of them hang out at the ultimate cool dive, Fred’s (915 Currie St.), but when Chow, Baby cruised by it was déjà vu all over again: boarded-up windows, bouquet of smoke, parking lot empty but for a Dumpster full of charred stuff. 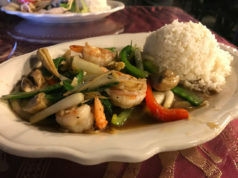 Yep, Fred’s has had another fire, but “Outlaw Chef” Terry Chandler says (via his web page; Chow, Baby and Terry are more MySpace friends than FiveFaves friends) that it wasn’t a biggie, and he’ll be back open “soon.” Chow, Baby defines that, arbitrarily, as two to four weeks. Which is sad and all, but Chow, Baby still hadn’t had lunch and now was really craving a big juicy burger. 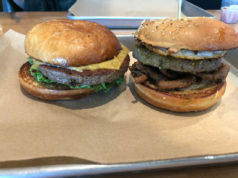 Good thing reader/new best friend Lisa had just written in to trumpet Nicky D’s (1605 FM 1187, Crowley), an old gas station turned burger joint that’s well worth the cruise south, even if Crowley is tied with Southlake in terms of its “Street signs? We don’t need no stinking street signs” philosophy. 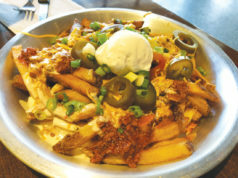 Tammy and Nick Danelski opened Nicky D’s in September 2004, but it has an old-timey feel – as in 1960s, not 1860s, what with the checkerboard linoleum floor, comfy booths and tile-topped tables, and open kitchen. Even in late afternoon (which, what with one thing and another, was when Chow, Baby finally got there) it’s crowded with Crowleyites. Friendly counterworker Pamela led a tour of the boards: Over the cash register is the regular menu (burgers, sandwiches, hot dogs); the left board holds the daily specials (like chicken-fried steak); the top right board is ice cream-related specials (like chocolate-mint shake); and Chow, Baby didn’t pay attention to what was on the bottom right board. Because Pamela had Chow, Baby at the Big Mushroom Burger ($4.70), half-pound huge and juicy-delicious; though the mushrooms were canned they were a-plenty, the Swiss was perfectly gooey, and the fries were hand-cut. Between the food and the folks, Nicky D’s is a great place to make new friends. Did the owner of The Café (3113 Denton Hwy, Haltom City) visit Babe’s Chicken Dinner House up in Roanoke sometime last fall and think, “You know what would be even better than this? Why, more than just chicken, served family-style amid neon palm trees and pink flamingos by waitresses who seem oblivious to the fact that they’re wearing Marilyn Monroe wigs.” Whatever the genesis, The Café, established in 1975 as breakfast/lunch only (Sun-Fri), recently added Babe’s-style country-family dinners ($8.95, Mon-Thur 3-9pm). The Café’s all-you-want veggies are diner-standard (pretty good mashed, runny creamed corn, frozen green beans), but the meats are excellent: “Mom’s lean beef meatloaf” had a nice sweet sauce, and the chicken-fried chicken was perfect. Between that and the flamingos, The Café is a must-try.